Now, safely at anchor and without the constant rolling, we were all able to finally get a decent night's sleep. Still, we were pretty sluggish the first part of the morning but after a leisurely breakfast we tackled the basic chores that come after a significant passage. We were visited by Lars, a young man (who we all agreed looked remarkably like my nephew, Simon) who is single-handing a 27' sloop called Twister. He lived for a while in Ocean Beach and left San Diego in April so we had much we could talk about. Corie and he swapped music. Even though Suwarrow isn't an official port, it is a Nature Reserve and visiting yachts are required to check in with the park rangers. Since our dinghy outboard is in many pieces and I lost one of the oarlocks overboard (a long, sad story), we had to paddle into shore. I'm sure that we looked comical as we had Corie on the bow with a kayak paddle and Ruthie and I in the stern each paddling with an oar. Since we were bucking a pretty good head wind, our progress was slow. As we pulled up to the small, white sand beach, a large man in swim trunks, tank top and flip-flops was there to greet us. This would be James. James is easily 6' tall and probably weighs in at 250 pounds. His skin is pretty dark and his long hair was pulled up into a cylinder shape on the back of his head. His beard is very long with the center of it - from his chin down - grey. I'm guessing he's in his mid-fifties. His two front teeth are missing and tattoos cover his body. He's an imposing figure but his attitude is immediately friendly. He sticks out is large hand to me, looks me in the eye and says with his New Zealand accent, "Hi. I'm James." He kisses Ruthie on each cheek. We're invited up to his house where he lives with the other park ranger, John, who is off doing something. There are a couple of buildings, one a low concrete affair and the other a small, two-story building where the foundation is a 10,000 liter cistern and heavy telephone pole-type timbers hold up the second story. There are no walls on the first floor. Both building are in the middle of dense tropical jungle. James strikes me as well-educated with a dry sense of humor. Though he is a Cook Islander, he was born in Wellington, New Zealand. Even though their communications systems are crude at best, he seems very current on world affairs and has what appear to be astute observations of the situation of Cook Islanders, who are given New Zealand passports. 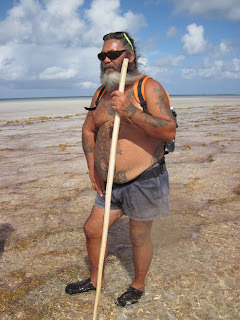 We easily talked for a couple of hours and then he gave us a tour of the island on which he and John live. They have a garden but the sandy soil makes it difficult to grow most vegetables so they're experimenting with different sources for mulch and ways to build up the soil. He shows us a spot where we can easily spear parrot fish though he warns us that there are places where we should stay out of the water because of the aggressive sharks. During our walk, we find John, stretched out in a hammock and introduce ourselves. He's younger than James, seems a little more reserved but still friendly. Once back at the 'house', we go through the paper work that checks us in. Four different forms to fill out plus he needs copies of our passports, ship's documentation and exit papers from French Polynesia. There's a $50USD fee but James refuses it as we had brought a couple of bags of groceries as other cruisers had emailed us of their needs before we left Bora Bora. In his official capacity as Park Ranger, James was very efficient but remained friendly and cracked jokes. 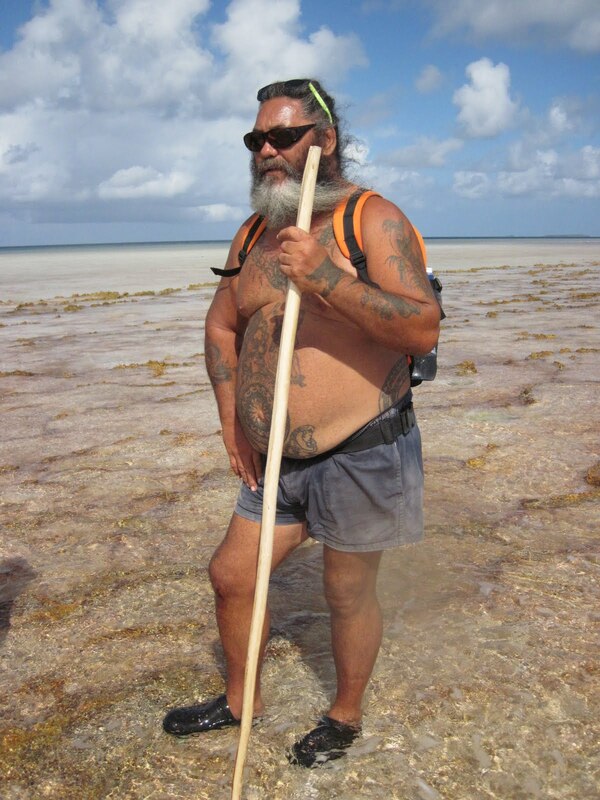 He promised that John and he would invite the people from the boats in for a Cook Island meal sometime this week. It was late in the afternoon by the time we left. This is a fairly popular spot for cruising yachts to stop. Last year, 109 boats stopped here and that was down from the year before. We're the 30th boat this year. The atoll was made famous with Tom Neale's book, An Island to One's Self although James said that Tom Neale wasn't the hermit he claimed to be as there was a village with 60 people living right next to him. This is quickly becoming one of my favorite places (Corie says I'm losing credibility as I say that about almost every place we stop). The water isn't as clear as some of the places in the Tuamotus but this is so wild and remote that it just has a special attraction to me. Thank you for your mention of Lars. Many of us in Southern California and Norway have been waiting for word about where he is. Hopefully he'll be in American Samoa soon where he can update us all. If you have any info about when he might have left Suwarrow, please email me at adriannal@gmail.com. Best of luck to you in your travels.